I never truly appreciated this top until today. It's a sheer animal print top that falls just before the elbows. It being sheer made it more versatile, because you can go for the classy look by wearing a black or white tight-fit tank underneath or be a little more playful by wearing a neon pink or yellow bandeau instead. :) I also like the tiny button in the middle that gives the neckline a little breather, and managing to show a little skin yet stay looking classy. 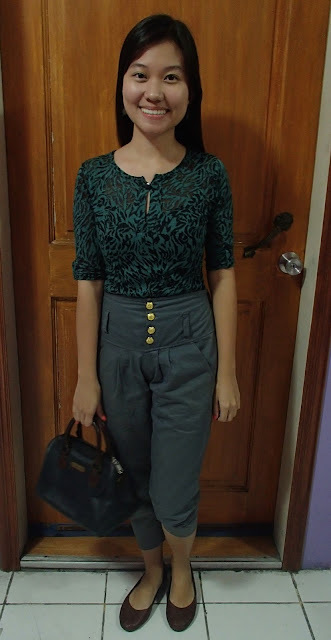 One tiangge find in this outfit is this high-waisted capris that has four gold buttons and pleats. I like the details on the buttons which made it more interesting, it also makes it so much easier to pair it with warm-colored accessories and shoes, right? My mom adores shopping as much as I do, and this was one of her bags from eons ago! It's a super vintage Ralph Lauren bag, which matches my outfit! Yaaay! The only accesory in my outfit? Bronze earrings! I really should learn to make it a habit to wear bracelets, necklaces and other accessories! One step at a time :D The only pop of color I had on was my nectarine nail polish! You can buy this at Face Shop, their nail polish are pretty long-lasting and also affordable.